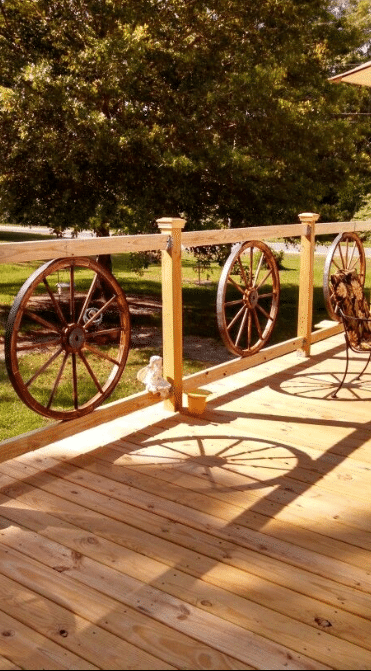 DIY Deck Railing Ideas – Everyone likes to return to the comfort of their homes after a long hectic day. They are one’s sanctuaries; safe from the burdens of the outside world. But there is always one part of your home that is more beloved than the others. It could be a cozy reading corner, a patio, the garden, a tea room, etc. 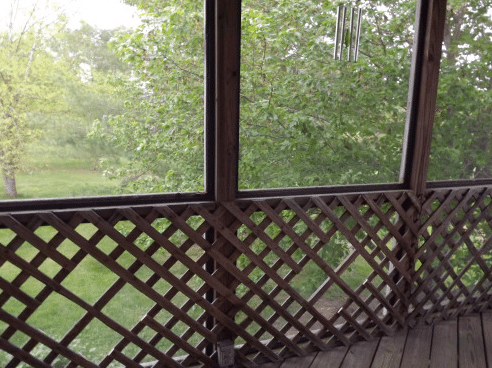 For me, the deck has been a place of de-stressing for a long time. Many others share my love for an aesthetically designed deck. 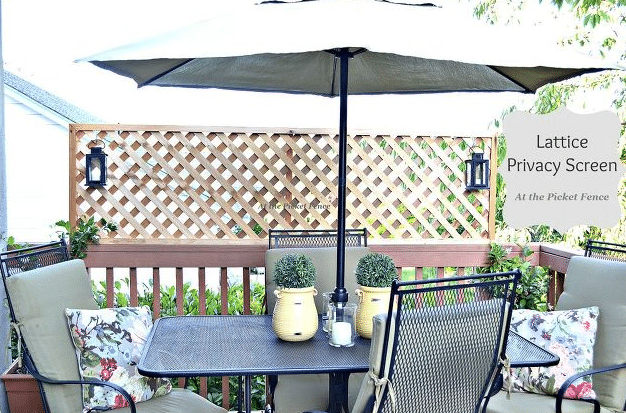 A well-designed deck can be used for multiple purposes. Whether you just want to spend a lazy Saturday afternoon reading a book or entertain your family and friends for a Sunday brunch, your deck is the go-to place in your home. 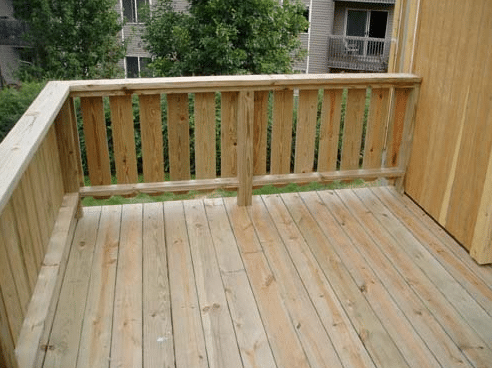 A retaining wall will give the deck a stage-like appearance. It will look spacious without the conventional post and spindles railing design. A retaining wall is simply built along the edge of the deck. You can also make it more creative. 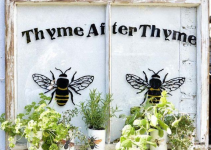 For example, make a small garden out of it. 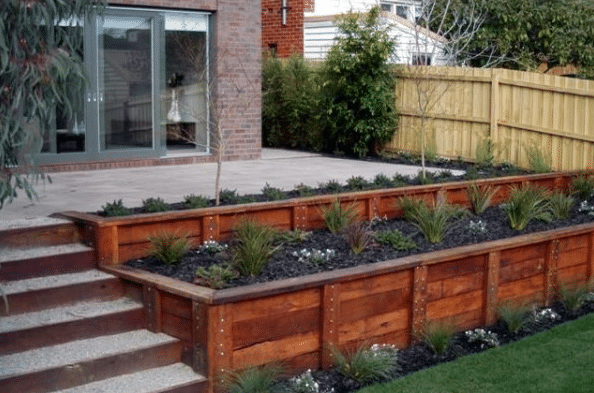 Plant grass and flowers into the wooden boxes and you will have a beautiful view to gaze at from the deck. Have any old crates lying around? Don’t let them go to waste. 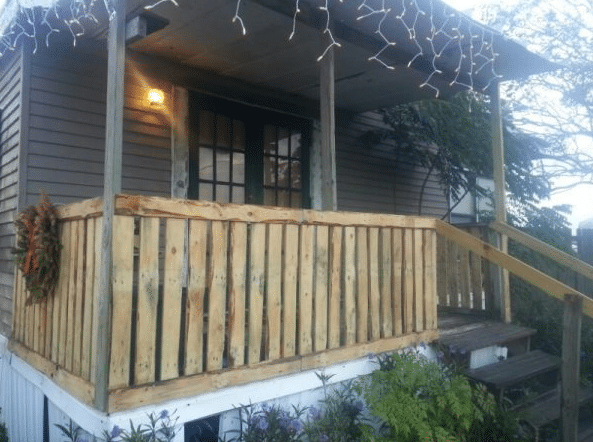 Take the wooden pallets out and recycle them into a railing for the deck. It does not only look classy but is actually a great way to save money on remodeling. If you share my love for vintage as much as for a well-designed deck, then this is a perfect idea. This may be a bit difficult and expensive to manage but the result is full of rustic charm. If you have the money and can make the effort, you will have to find wagon wheels and learn how to fix them between posts. 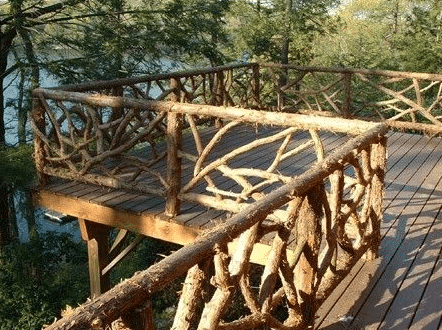 Bare tree branches could make for a great idea for a deck railing. If you live near a place with a lot of trees, you can find branches that can be taken off without harm to the trees. 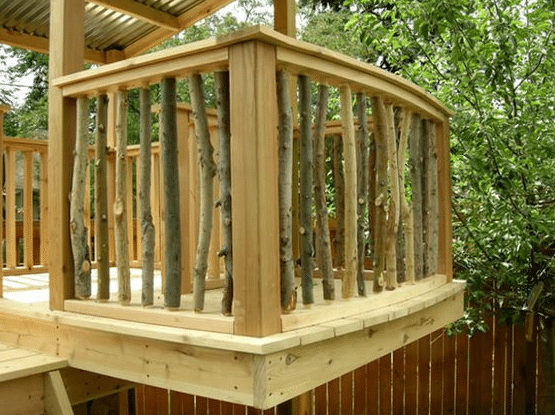 Build a traditional wooden post frame for the railing and simply add the branches as spindles. You may have to do the cutting carefully and neatly to get the right look. This messy wooden railing gives off the appearance of cracked ice, hence, the name. It is incredibly creative while just using tree branches. It may also take a certain level of skill to build. If you think you have a crafty spirit, then you may actually be able to pull it off. You might love your deck but an open space in a compact neighborhood can cause a lack of privacy. Don’t let that hold you back from making the best out of the deck. Just add a wooden lattice structure above a basic wooden railing. Not only it prevents against prying eyes but looks great. Apart from a lattice screen, you can make an entire railing our of lattice panels. In this picture, you can see that taller posts have been installed that completely surround the deck. The lattice panels have been installed instead of traditional spindles. If you already have a lattice railing, then you can simply carve it out to make a newer geometrical design. 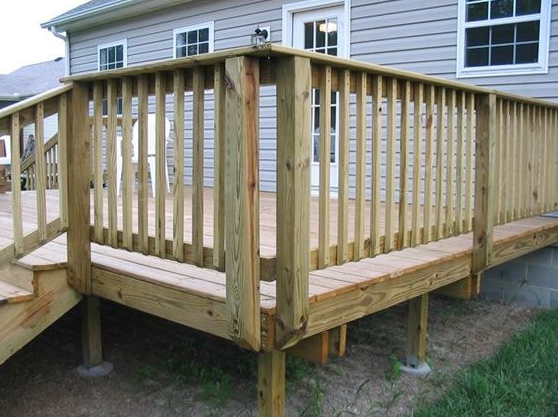 This is very similar to a traditional deck railing. However, just a minor change in the posts’ installation gives a fresher appearance. Instead of mounting the posts inside the deck, mount then outside the structure. It introduces a newer dimension. This is a combination of benefits. You get to have a minimalist railing that looks contemporary as well as provides an unobstructed view of the surroundings. This is similar to the cracked ice railing but is a bit messier and less structured. You will have to find thin tree branches and thicker logs to build this. It creates a very rustic look that is amazing for having a cozy deck ambience. 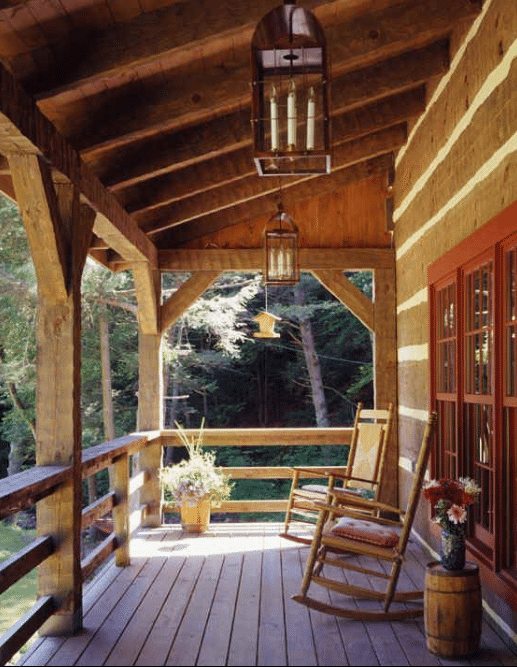 If you have ever dreamt of having log cabin experience, you can have one right at your deck with this idea. 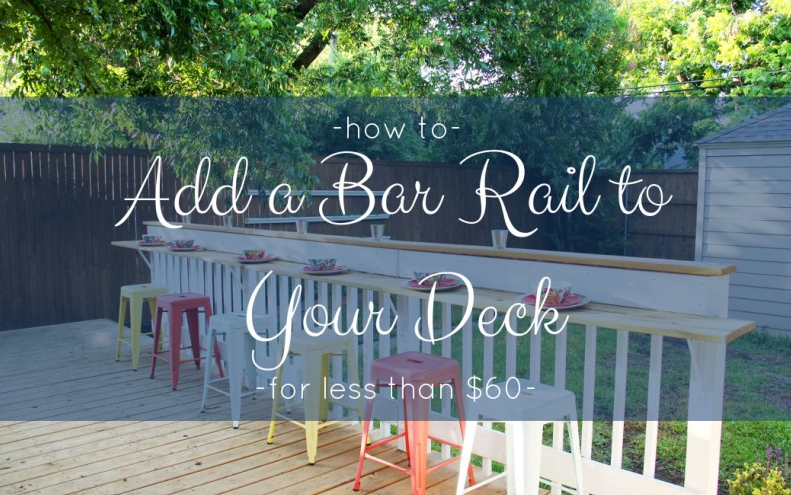 Have a basic railing around your deck but don’t really have the energy to change it? You can just upgrade it and make it more functional in the process. Add a wooden bar area along the railing. It is great for having some laid back times with friends and family. 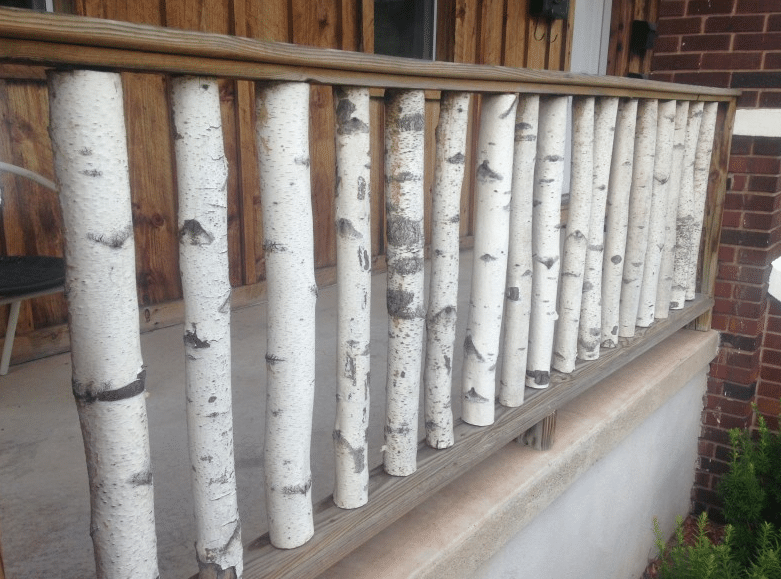 If you have excess birch wood branches lying in your backyard, don’t let them go to waste. Make a railing out of it for the deck. Even a basic design will show character and it is inexpensive. If you have kids running around the house, you can give them something to make summers more fun. 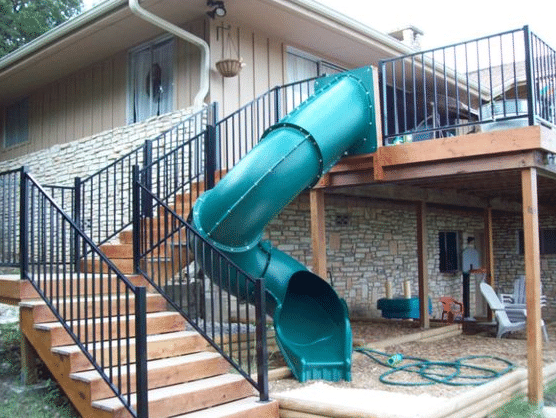 A deck that is above ground can be installed with a kiddy slide. You don’t necessarily have to be a kid to enjoy this. Tired of looking at all the complex railing ideas? 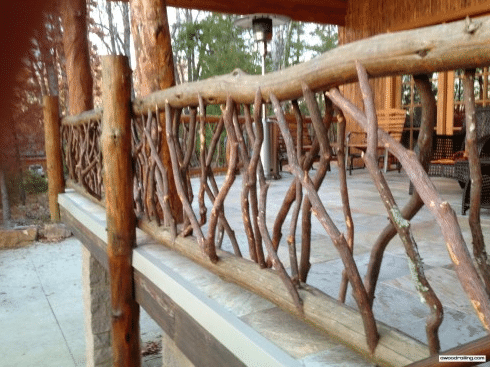 You can also add a unique twist to a basic railing structure. Just make the vertical spindles between posts horizontal and you have a fresher appearance for the deck. This is a neater version of the pallets railing. Instead of using crate pallets, simply cut flat slats of wood of your choice. Use a basic railing structure and install the slats as spindles. It is your regular railing yet provides a modern feel as well. 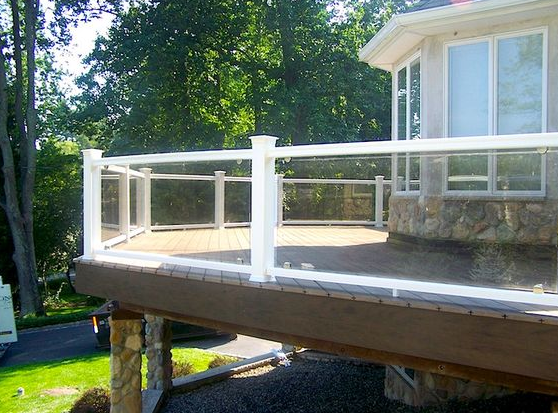 Hopefully, one of these DIY deck railing ideas may have inspired you and you will be preparing to upgrade.